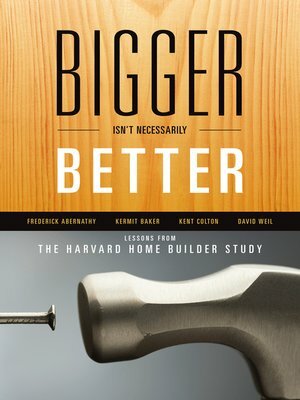 Bigger Isn't Necessarily Better examines the performance and operation of the US homebuilding sector based on a detailed survey of large home builders conducted by the authors in the period of the great building boom of the 2000s. In contrast to the many books that have focused on the financial side of the housing sector prior to the Great Recession, the book examines the operational side of the industry and what did, and, more importantly, what did not, happen during the period of unprecedented growth. Despite the rise of very large, national homebuilders during the boom years from 1999 to 2005 and the consolidation of the industry that accompanied it, the authors find that major homebuilders often did not adopt innovations in areas ranging from information technology, supply chain practices, and work site management, nor improve their operational performance. Given this, the book discusses what homebuilders can learn from other industries as they face a challenging future.